He tried to stop a robbery – and paid with his life! Innocent blood was again spilled in the city as the sens.eless gun violence claimed yet another life. Dennis Williams, 54, of Supaul Street, better known as “Bo,” was killed in his workplace at the Three Stars Quality Chicken on Vernon Street at about 11:00 this morning. Witnesses said that two men went into the store to rob the business of the proceeds brought in by the delivery truck, which had just pulled up after the delivery and sale of chicken. One of the robbers aimed a gun at the salesman, and demanded the money, but Williams intervened and one of the men punched him in his face and he fell. Williams got up and struggled with the thief to try and take away the gun. The gun fell from the robber, and the other thief picked up the gun and shot Williams in his neck. The two men then ran out of the store, into the hands of policemen on patrol who were going up Vernon Street, having been alerted about the robbery in progress. Shortly after the two gunmen were captured, and while the men were being taken away to the Queen Street Police Station, a third person was captured when he came for his car, which was the suspected getaway vehicle. Police also recovered a black Taurus 9mm pistol, which was thrown away by one of the two thieves when they ran into police while escaping from the store. A witness said that Williams was lying face down on the floor by the door of the store, and when he was turned over, blood began to flow out of his mouth, and he began to gasp for air. Williams was rushed to the Karl Heusner Memorial Hospital by an ambulance that went to the scene, but he died en route to the hospital and was pronounced dead on arrival. Residents of the area said that they had previously seen four men walking and standing around, scrutinizing the store. The four men, two of whom were on bicycles and two of whom were walking, went down Vernon Street towards Youth For the Future Drive. Then two of the men came back and went into the poultry store when the truck pulled in while the other two men rode away. The witness said that when they arrived at the store, they saw Bo lying on the floor bleeding from the neck, and two men were being held down by the police on the ground in front of the store. Amandala was also told that one of the captured men said that they needed the money because their boss was having a party this Saturday, and Williams stopped their robbery. Williams’ sister, Enid Williams, told us that she was at home watching television around 12:00 noon today, when her son came home and told her that Bo had been shot in his neck. She did not believe and told her daughter to check it out. Her daughter confirmed that it was true after she made a call. Enid said that she went to the KHMH, but Williams had already been taken to the morgue. She went to the morgue, where the policeman who was present gave her permission to see him, and that was when she saw and identified her brother. She was then told that the two men who committed the robbery were in custody, and one of them was his killer. She then went to his workplace where he was shot, and was shown where it happened. She said that it was no gang-related shooting, and it did not happen because his nephew, Jason “Soup” Williams, was the reputed boss of the Supaul Street Gang, as many believed. She said that it was a plain case of robbery. He struggled with the robbers, and they shot him without remorse. 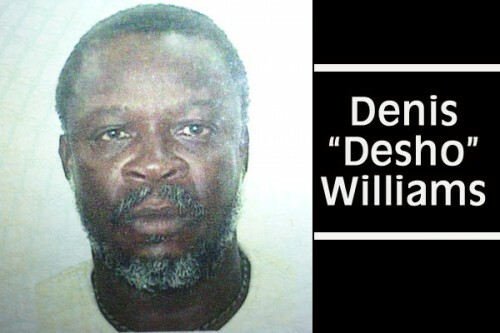 Dennis Williams is survived by his two sisters, including Enid, five brothers, a host of nieces and nephews, and many friends and acquaintances. He had been working at Three Stars Quality Chicken for 10 years. Williams is the second person killed at his workplace in less than two weeks, the first person being David Myvette, who was killed by a gunman who shot him while he was concreting the Electric Avenue Road.